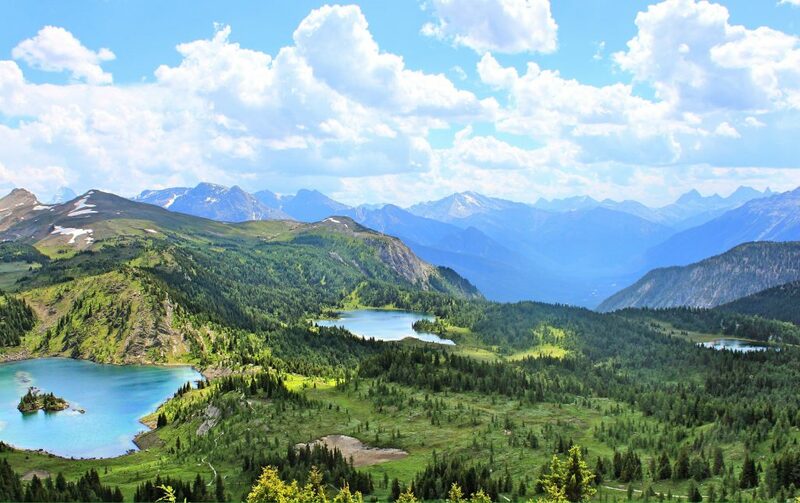 No matter when you visit the Canadian Rockies, they are breathtakingly beautiful. Their majesty refreshes the spirit and rekindles some of what is best in all of us. Imagine sharing the experience with those you love. Where you stay in Banff is important to having the experience you want. It can be quiet or busy, simple or luxury - and we can help you make your best choice. Wander the lively main street or explore the expansive wilderness that surrounds Banff. Try a two-step in a local cowboy bar or hear out with your horse for adventure in the old-fashioned western way. Banff is the busiest little town in the Canadian Rockies and we love it because it’s a great base for all kinds of mountain adventures. You can be out hiking through an ice-filled canyon in the day and relax at night with a hearty homestead meal and a hot-tub under the stars. Spring and summer are perfect for sharing the outdoors, here. Enjoy hiking, golfing, boating on Maligne Lake, or our favourite – a blissful sunrise canoe paddle across misty Patricia Lake. Enjoy the beauty of the Canadian Rockies in winter as you explore past frozen waterfalls, canyons and crevices on a unique icewalk adventure. Jasper is a small railway town in the middle of the largest national park in the Rockies. Take a moment to yourself to relax and just breathe in the fresh air – and the pristine beauty– and then head out and explore this exhilarating outdoor playground. The iconic Chateau Lake Louise was once the exclusive playground of kings, queens and Hollywood royalty. Today these awe-inspiring mountaintop views reward guests who make the journey from all corners of the world. We’ll help you book the perfect Chateau stay where you’ll make memories to last a lifetime. Lake Louise offers year round access to pristine wilderness, endless outdoor adventures and exquisite culinary delights. How can you possibly describe iconic Lake Louise? It’s one of those places you just have to experience for yourself – paddle across the emerald waters, hike up to the teahouse nestled high in a mountain meadow or just relax on the shore and you’ll know why words and photos cannot begin to do this Canadian destination justice.